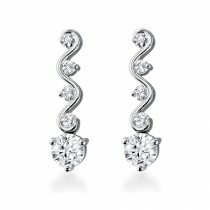 Multi-stone Diamond Earrings	There are 9 products. 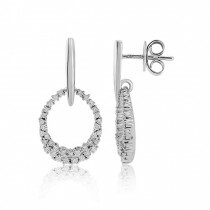 Each of these diamond set open oval-shaped earrings contain 37 round brilliants and measure 25mm in height. The earring is articulated so that the diamond section moves as you do and shows of these dazzling diamonds to best effect. Post and scroll fittings. These seven stone petal cluster diamond earrings sparkle like the stars. Measuring 10mm from point to point these impressive cluster earrings contain over over a carat of fine white diamonds.Post and scroll fittings.